The 2017 Valhalla is a continuation in style and quality from the 2016 vintage. Lifted savoury aromas jump out of the glass followed by a ripe fruit bowl of nectarines, apricots and assorted citrus fruit overlaid with a lick of wild manuka honey. The palate is focused yet powerful with a spine of fresh acidity cushioned by generous ripeness and complemented by natural fruit and oak tannin. 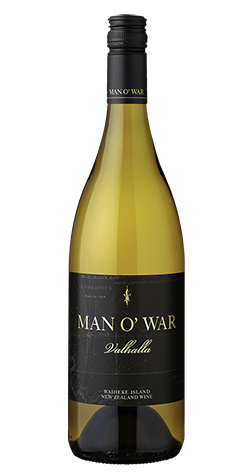 Valhalla 2017 is a wine built both for ageing and is extremely complementary to a wide range of cuisines in its youth perhaps Asian inspired spice dishes, rich seafood or a selection of cheese and dried fruits. Our Chardonnay vineyards are categorized by being either hilltop with volcanic deposits in the soil which are also cooled by a combination of elevation and sea breezes, or steep sheltered sites in the valleys which are warmer and rich in clay. The hilltop ‘volcanic’ sites are gently whole bunch pressed to preserve their minerality whereas the richer more powerful fruit coming off the sheltered hillsides are crushed by foot and left to soak on their skins before pressing. Following pressing all the parcels to undergo wild fermentation on ‘full solids’ without any racking of the juice, the temperature is un-regulated and they progress to dryness in less than 10 days. This fermentation style contributes interesting savoury aromatics while the juice solids contribute tannin to the wine. Following fermentation the wines are left in a barrel on gross lees un-sulfured until late December where they will then get sulphured, left for a further month and then tasted in the New Year to confirm the blend and then bottled pre-vintage.